Amazon has just lowered the price of another 007 favorite on Blu-ray to under $10! 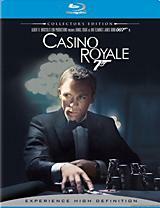 The online retailer is selling the 2-disc Collector's Edition Blu-ray of 'Casino Royale.' starring Daniel Craig in his first outing as James Bond for just $9.99 (60% off suggested list price). Click here to be linked to the sale. It is unknown how long this sale will last, so if you were planning on picking up this fantastic reboot now is the time!